Bad news, Germany. One of your own has betrayed you. 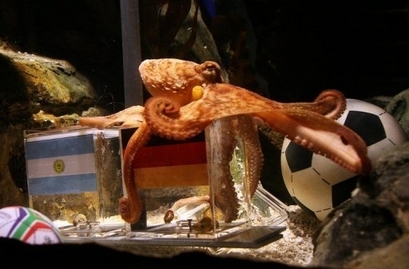 Paul, a sports-predicting octopus who lives at the Sea Life Aquarium in Oberhausen, Germany, has turned against his German compatriots and predicted that Spain will win the World Cup Quarterfinals match between Spain and Germany. Strangely, Paul the sports octopus has a pretty strong prediction track record. Paul is given two tanks, one marked with one flag and one marked with the other flag. Whichever tank Paul eats a mollusk from is the side that wins. So far in this World Cup, Paul has nailed Germany’s wins versus Argentina, England, Ghana, and Australia; he even nailed the team’s loss to Serbia in the round-robin portion of the World Cup. The only time Paul has erred has been when he chose the winner of the 2008 European Championship, when he chose… get this, Spain over Germany. Is Paul Spanish-biased? Am I crazy for writing 200 words about a gambling octopus? Is it perhaps both? That’s why I always turn to Mega-Shark for my gambling advice.